Faced with increasing environmental challenges such as hotter summers and large storm events, many cities in North America are following Europe’s example and implementing green roofs as part of their urban greening strategy. 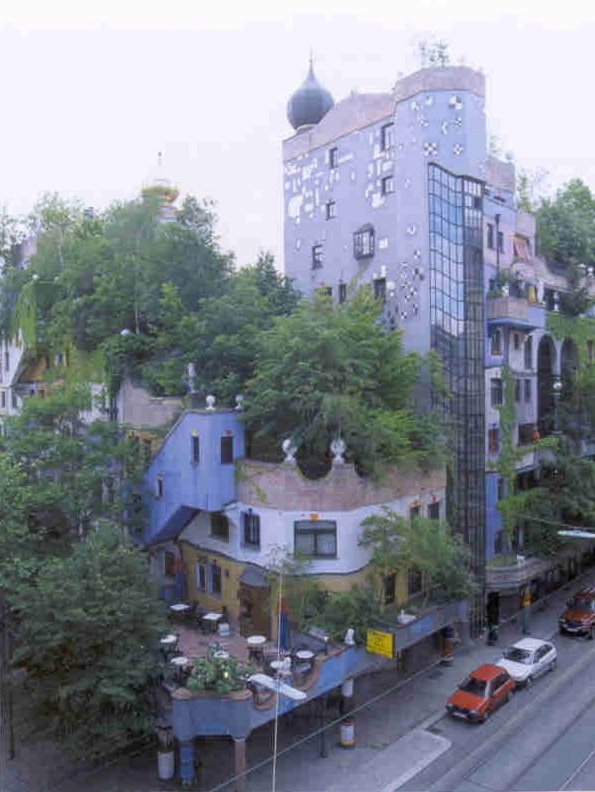 Though more common here than a few years ago, green roofs are still new enough that not everyone is sure what they are. Below are answers to commonly asked questions about green roofs that provide a general overview. For more detailed information and resources, please see the resources listed below or click on the links provided. There are three main types of green roofs- extensive, intensive and semi-intensive. The easiest to install due to the lighter weight are extensive green roofs, whose depth of material is 6” or less. The type of vegetation on extensive green roofs are most often sedums, or small, hardy alpine and desert plants, though sometimes grasses can also be used. Extensive green roofs are often inaccessible. Semi-intensive green roofs are a little thicker, usually a bit above or below 6”. They can have small bushes, grasses, and a range of flowers, and are sometime accessible. Intensive green roofs have a much thicker depth of material- over 6”- and can support trees, shrubs, and many different types of vegetation. Often these types of green roofs are over parking garages or transit and may be at ground level, such as Millennium Park in Chicago, or Vancouver’s Robson Square, and are usually accessible. Because green roofs need to be structurally supported, one of the most important considerations is the weight of the green roof when fully saturated. The heavier the green roof, generally the more expensive, though this cost is reduced if the green roof is part of the original design and the roof is designed to withstand the added weight. There are numerous benefits of green roofs, most of which fall under public benefits, such as a reduction in air pollution, or private benefits, such as reduced heating and cooling costs. Below is a brief outline of the most common benefits. Green roofs can reduce the urban heat island effect (UHI) by keeping the surfaces of roofs cooler than a black tar roof. For example, the building that houses the Chicago City Hall on one side and the Cook County offices on the other is only covered by a green roof on the City Hall side. When temperatures reach 150 degrees Fahrenheit (F) (65 degrees Celsius (C)) on the Cook County side of the roof, the City Hall green roof is only 90 degrees F (32 degrees C) (City of Chicago). This cooling benefit of green roofs also reduces the cooling costs of buildings, particularly on the upper floors. Keeping cities cooler in turn reduces the electricity demand during hot summer days, thus reducing the load of coal-fired plants and reducing the chance of black-outs. A study done by Environment Canada found that a 25% green roof coverage could reduce the UHI by up to 1.8 degrees F/1 degree C for 1/4 of the city; while a 50% coverage increased this to 3.6 degrees F/2 degrees C. Another Environment Canada study found that the energy demand associated with even a 1 degree C/1.8 degree F increase in temperature is 600 MW (Doshi et al 2006), while the U.S. Environmental Protection Agency (EPA) found that in cities with a population over 100,000 the increase in peak demand electricity was 1.5-2% for every temperature increase of 1 degree F/0.6 degree C (EPA 2002). What does this all mean? At 2005 energy rates, the cost of the UHI effect on electricity demand could be as much as USD 1,000,000/CAD 1,174,000 per hour, or over 1,000,000,000/CAD 1,174,500,000 annually (EPA 2002, cited in GRHC 2005 Policy Workshop manual). Vegetation, and in particular the urban forest, has long been shown to absorb particulate matter and improve air quality. Researchers in Toronto have used an urban forestry model to estimate the equivalent air pollution mitigation possibilities of green roofs, and found that green roofs, when combined with grasses, shrubs and trees, could play a significant role in mitigating urban air pollution (Bass and Currie 2006). If only 10% of Chicago’s roofs (6540 ha) were greened, 17,400 tons of NO2/y would be removed, resulting in city-wide public health benefits from reduced air pollution of $29.2 million to $111 million annually. (Clark et al 2001 ). Green roofs reduce the quantity of stormwater that runs off the roof during rain events by absorbing up to 60% of total runoff and up to 85% of the first wave of rainfall (Moran et al 2004) (Hutchinson et al 2003). By reducing the amount of stormwater runoff through green roof absorption, cities can reduce the pressure on ageing pipes, reduce stormwater overflow, and save potentially millions per year on avoided big pipe solutions or upgrades. 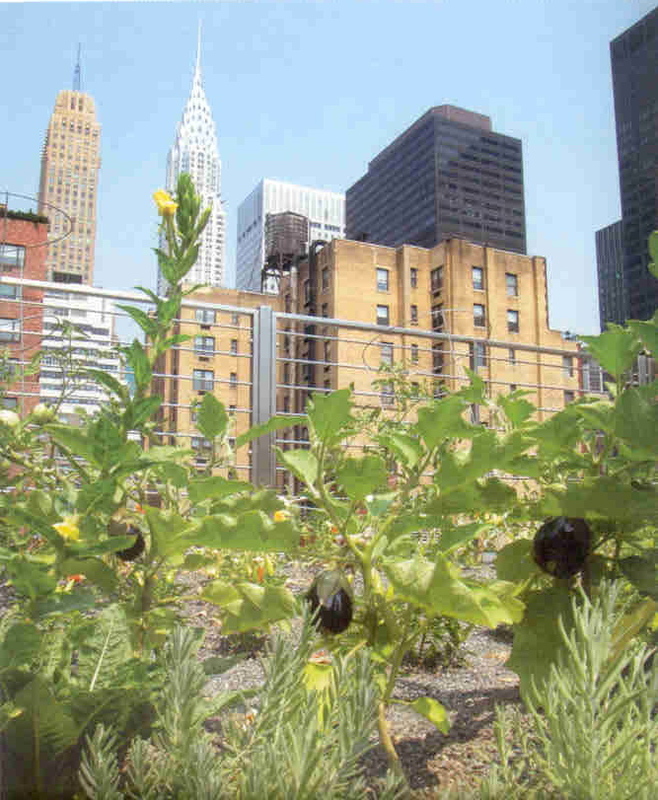 It is estimated that if all of New York’s flat roofs were greened they would divert 13 billion gallons of stormwater that would otherwise head into the city’s ageing sewer system (Norquist 2008). Green roofs also improve the quality of stormwater runoff and have been found to filter many of the metals, polycyclic aromatic hydrocarbons (PAHs) and other pollutants (Clark et al 2001). Green roofs have the potential to grow food, and have been used by both community groups looking for additional garden space, as well as restaurants and hotels who use the roofs to provide fresh herbs and lettuces. There are many benefits association with an increase in greenspace in the city; a few of the major ones are outlined below. Many studies have been done outlining the increased liveability and quality of life of neighbourhoods with access to greenspace. Access to greenspace increases property values, fosters a sense of community, and has numerous health benefits (see references below). There has a been a recent interest in the potential for green roofs to link with other urban natural corridors and provide islands of biodiversity and habitat. This is particularly true for dense urban cores where there is little, if any, greenspace. Providing habitat has become important since many cities have committed to intensifying land use through infill development. Legislation which protects the habitat of the Black Redstart in London, England, helped to promote green roofs in London. As vacant lots that had become the home of the Black Redstart were being developed, crusaders such as Dusty Gedge argued for rubble or green roofs as an alternate habitat for the birds, spearheading the green roof movement in the UK (Gedge 2004). 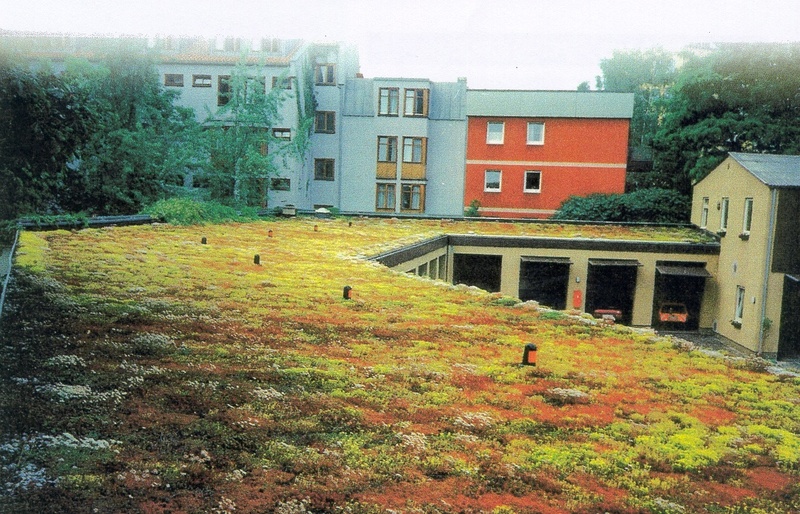 Stephan Brenneisen, out of Switzerland, has done research for years on biodiversity and green roofs and found that they can be provide excellent habitat to birds and invertebrates (Brenneisen 2003). There is also a movement to use moss and microbes as a more ecologically-viable foundation for green roofs and biodiversity. There is little published research on the social or health benefits of green roofs per se. Most of the research currently cited is based on work done by social scientists that has shown that contact with nature improves our health, well-being, and socialization and community, and then extended to apply to green roofs. Green roofs have been put on hospitals, condos and women’s shelters to provide healing gardens, amenity space, and safe play areas when greenspace on the ground is either not feasible or available. My doctoral research examines the potential health and well-being benefits of green roofs that are visually or physically accessible to office workers in the central business districts of Chicago and Toronto. The results will be out in the summer of 2009. Please see a list of resources below for more information on the health benefits of nature. Green roofs, by providing an extra layer of insulation on the roof, have proven particularly effective at reducing heat gain in hot summer months. A study by the National Research Council of Canada found that a green roof reduced the daily demand for air conditioning by 75% (Liu et al 2003). Due to a more moderate roof temperature, green roofs also increase the effectiveness of HVAC (heating, ventilation and air conditioning) systems, as well as solar panels and photovoltaics, all of which operate more efficiently at moderate temperatures (Leonard and Leonard 2005). A green roof covers the roof membrane which otherwise would be subject to harsh weathering and more rapid deterioration. Typical roofs in North America have an average lifespan of 10-15 years (Hutchinson 2001). Protected membranes, which are buried beneath insulation, have lifespans closer to 20-25 years, and this is considered to be closer to the lifespan of roof membranes under a green roof (Mutton 2004). Green roofs, through their insulating properties, can reduce sound by between 40-50 decibels, depending on the type of green roof (Peck et al 1999, cited in Green Roof Policy Development Workshop, GRHC, 2006). Green roofs are a highly visible symbol of a green project, and many companies and cities have found them to be an effective way to point to other green initiatives they may be engaging in that are less visible. 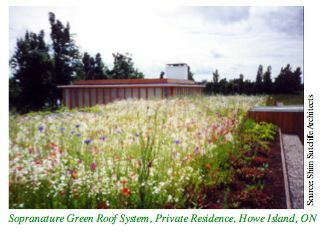 The cost of a green roof varies, but an extensive green roof can run between $10-24 a square foot (www.greenroofs.org). Usually the thicker the depth of the green roof, the more expensive it is, particularly if the building needs to be structurally reinforced to support it. ARE THERE INCENTIVES OUT THERE TO HELP OFF-SET THE COST OF A GREEN ROOF? Yes, usually from a municipality who is trying to encourage the implementation of green roofs. Chicago and Toronto, for example, both have Green Roof Grant Programs that helps offset the cost of green roofs to selected winners, while Chicago also has fast-track permitting and other incentives for developments that are green. ARE GREEN ROOFS LINKED TO GREEN BUILDING AND LEED?